If you follow our website then you will know we design and make a totally awesome range of Rugby Ticket Wedding Invitations and it is only natural that couples would want to take that rugby theme and also carry it through to the rest of their wedding stationery. In the case of this post we want to show you our Rugby themed Wedding Table Plans which perfectly keep the theme running on from the rugby wedding invitations. In this first example we had already created the Rugby Ticket Wedding invitations for Aoibheann & Tudor and they wanted a rugby wedding seating plan to match. 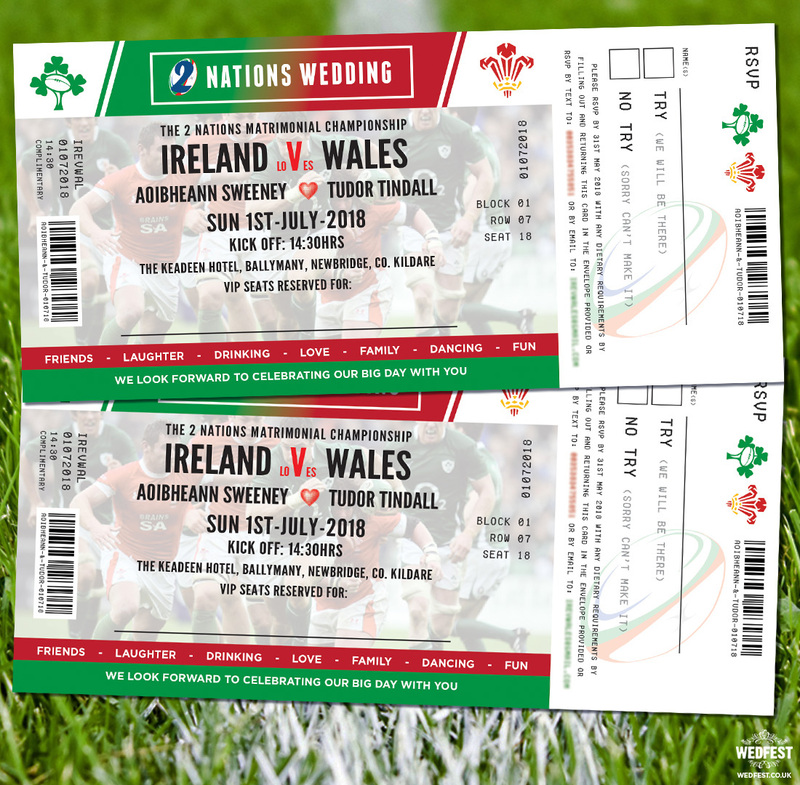 Aoibheann is from Ireland and Tudor is from Wales so they loved our 2 nations rugby wedding invitations theme as it perfectly suited their Irish & Welsh backgrounds, and of course their love of Rugby. 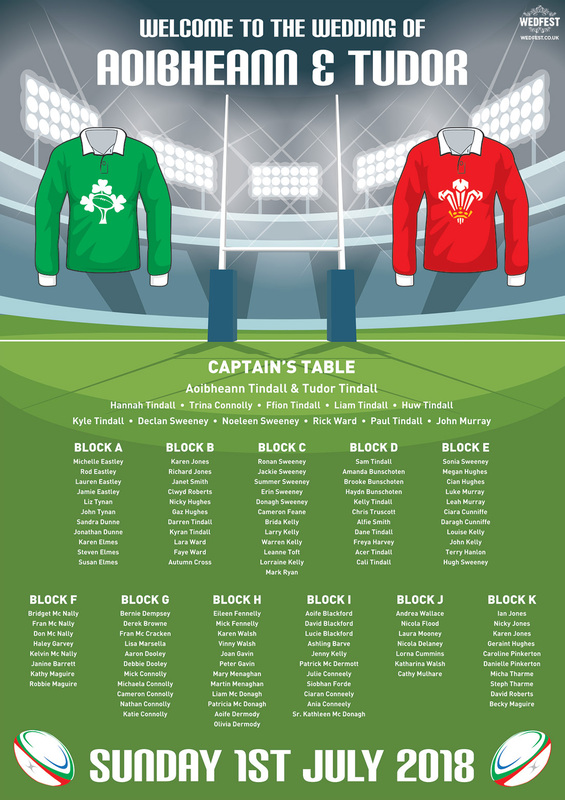 For the table plan design we have the image of a rugby stadium and two classic rugby shirts representing Ireland and Wales. These guys named their wedding table names after blocks that you would find in a stadium such as Block D, Block E etc. 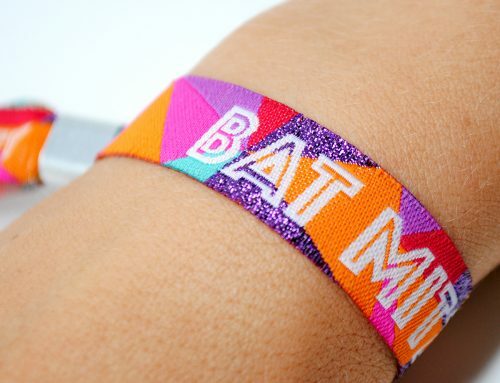 which perfectly fits the tone of attending a rugby match or a rugby themed wedding in this case. 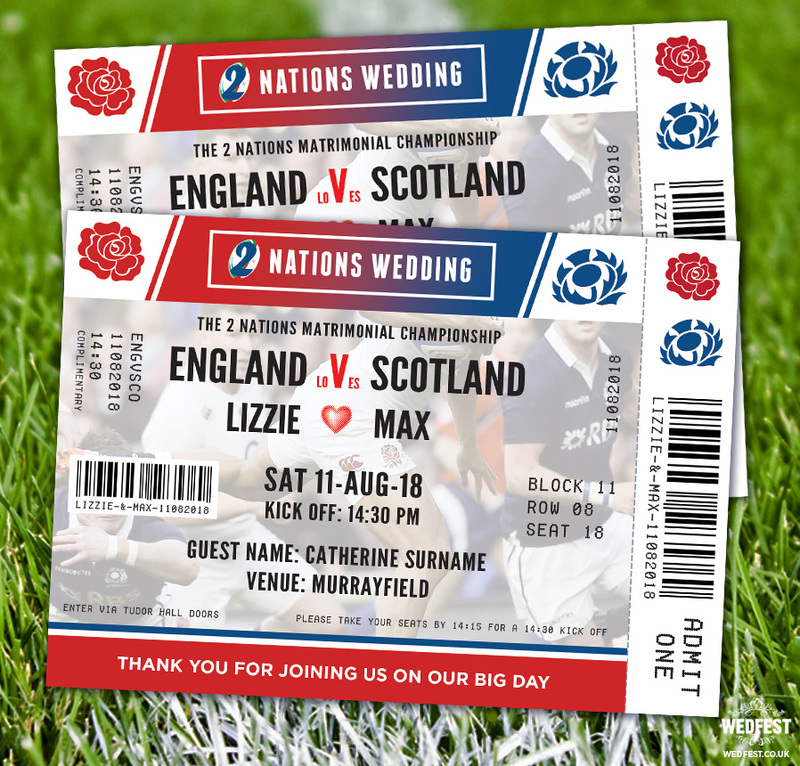 For Max & Lizzie’s Rugby Themed Wedding we designed and made them Wedding Rugby Tickets for each of their wedding guests. Each ticket had the guests name on it and the details of what table they were sitting at. They then named all their wedding tables after rugby stadiums such as Murrayfield, Stade de France, Twickenham and Lansdowne Road etc. So for example in the sample above-below Catherine would have been sitting at the Murrayfield Table. They then gave these tickets out to all the guests at the drinks reception after the wedding ceremony. They then also had a matching rugby themed wedding seating plan set up so guests could see where everyone was sitting. Lizzie is English and Max is Scottish so for their rugby themed wedding stationery we had a England vs Scotland theme. 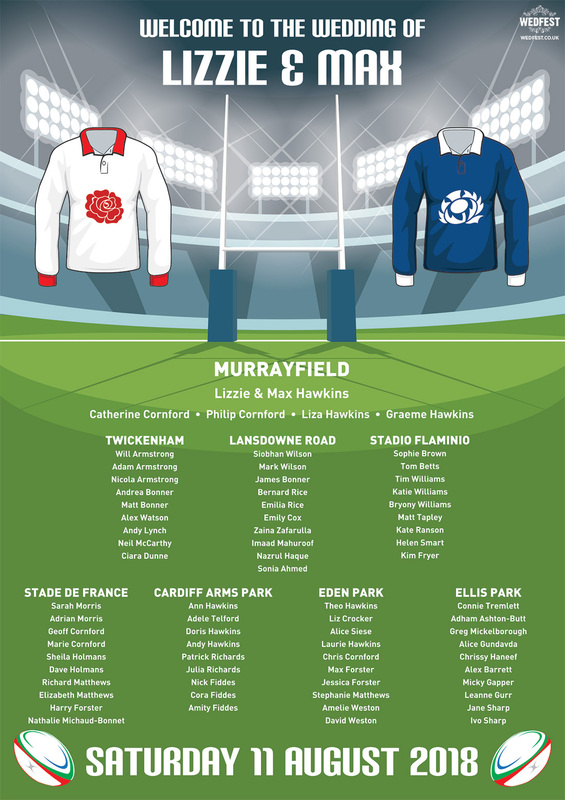 If you are a Rugby Bride or Groom like the look of these Rugby Wedding Table Plans or our Rugby Ticket Wedding Invitations and would like something similar for your big day please click here to get in touch.